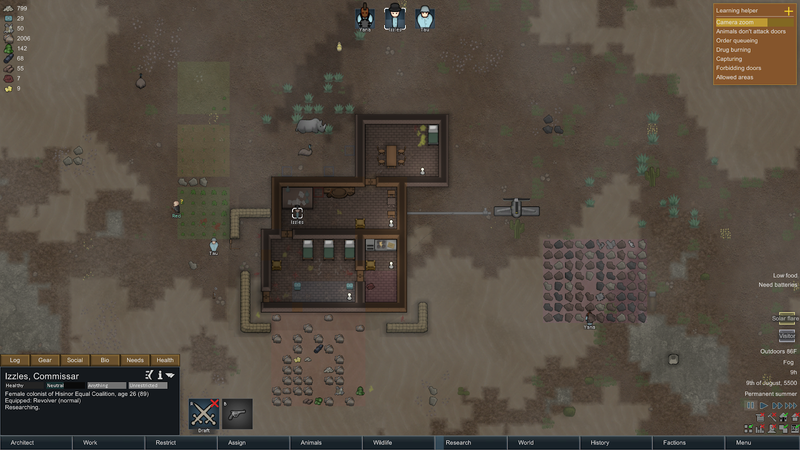 When I landed at the location I’d designated in my latest game of Rimworld, I felt optimistic. It was permanent summer, but not so arid that there wasn’t anywhere to plant. I thought that this time, I’d make it a few years. A few minutes later, I realized I had gotten myself into a death spiral. There’s that one moment in ill-fated strategy game round when you know you’ve gotten yourself into an unfixable situation. In SimCity 4, it’s when your expenses exceed your profits. Once, in Dwarf Fortress, one of my dwarves got bitten by a were-horse, then attacked by a cyclops. In Frostpunk, if you let your citizens down too much, it can become impossible to get their hope back up. You can spend a lot of money building a coaster in RollerCoaster Tycoon or Parkitect only for it to be unpopular, dooming you to never recover what you spent. This game of Rimworld had a moment like that. I ran out of food. None of my colonists had much skill in planting, but I thought I’d worked it out. They sucked at harvesting, but they’d learn, and we were getting some food anyway. Then I realized that while all my crops had been planted, no one was harvesting them, so we didn’t have any food. I spent a good ten minutes rejiggering the work duties so that everything I needed to get done would get done. Even after that, we were still barely making enough meals to live on. Then, my crops had a blight. Oh, and we also had an eclipse, and then moments later, a solar flare. What I should have done was stop everything and have all my colonists cut the diseased plants. What I did instead was mark those plants to be cut, and then assign a whole lot of other duties that my colonists went off to do instead. I didn’t notice that no one had cleared the diseased plants until after a good half my crops were blighted. Because my colonists are stupid fuckers, and because we kept getting raided, I wasn’t able to save any of my crops. We’d already harvested all the naturally growing berries, and given that the dominant species of the area was rhinos, hunting was sparse. I tried to get my crops going again, even though we had run out of food and at least one colonist was starving. Then a pack of wild, man-hunting chickens attacked. It was then, as I watched one of my colonists try and fail to melee attack a chicken to death, that I realized this colony was a lost cause. Knowing when to give up is a great way to learn in strategy games, and also in life. If you can identify the point where you failed, you know what not to do next time. I’ve always been a perfectionist, and also extremely competitive against everyone including my past self, so giving things up or admitting defeat is hard for me. But, as that colonist failed to punch a chicken, I reminded myself that some things are not worth saving. Sometimes, it’s better to regroup and start again. Next time I start a game of Rimworld, I’ll pay closer attention to crops and assigned duties. If I get a blight, all production will stop until the diseased plants are cut. I’ll get a surplus of meals instead of just enough to live on. And if a pack of manhunting chickens come by, I’ll send out the colonist with a gun.